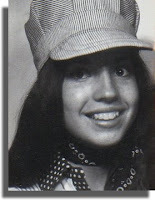 I wasn't quite 15, but still on the hunt for a part-time summer job. Even though I had pitifully few skills, my quest didn't last long. Because a friend of mine told me the Railway was looking for hostesses to work on a vintage locomotive for their new tour. They needed a couple of girls to greet passengers and serve food on the two-hour excursion running twice every Sunday from May to September. Hey! We were girls! We could greet people! We could serve food! Yes, the requirements for the job were demanding. Still, surprisingly we were both hired. Before the first trip, we decided to make our own uniforms. We searched high and low, finally finding the proper grey pinstripe fabric collecting dust at the back of an ancient store in, of course, the worst part of town. We sewed flattering overalls with flared legs, bought matching red and white shirts, red bandanas and received official railway caps from the company to finish off our look. And in true 70's fashion style, we also added lenticular eye buttons to the hips. A tad bit naughty I fear, as we swaggered up and down the aisles, "winking" at the customers as we passed. 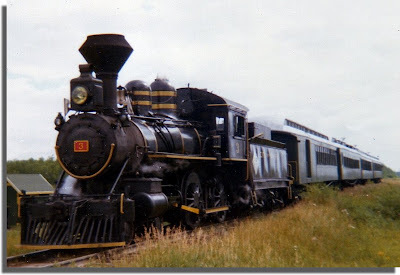 For years I worked on The Prairie Dog Central, a steam powered train from 1882. I became a master of the "weave"; the gait you must perfect to counter-sway to the movement of the train, lest you spill your sweet treats all over some unsuspecting tourist. My favorite memory was the day of the Great Train Robbery. The passengers didn't know what was planned. During the ride out to the countryside, a group of horsemen burst through the trees, galloping alongside the train, fake guns a-blazing. The locomotive came to a halt as the passengers wondered what the heck was going on. Soon the Engineer and Fireman got out with their hands up in surrender as the robbers seized their bags of booty. 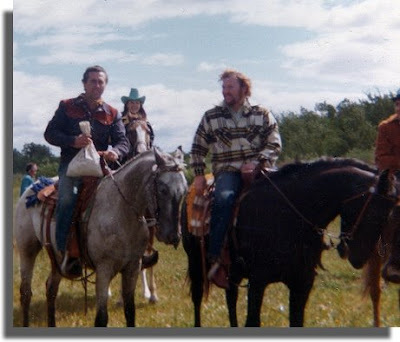 But before they departed, one cowboy grabbed me from the coach, swept me up onto the back of his horse and sped off back into the bush while I held on for dear life. Shocked at the surprising turn of events, I watched from the gang's hiding spot as the train left without me. Then we bolted off for the end of the line, the thick woods providing cover. And were waiting to greet old Number 3 when it finally came chugging up. The looks on the faces of those kids was priceless when they saw me safe and sound, laughing with my "captors"! even though my daughter may think that yes, I AM that old. It was NINEteen seventy-five, honey. Wow! That is so cool! What a great job :) Love the photos too! I'm so jealous! My first pocket money job (at about thirteen years old) was seasonal fruit picking, for which I had to get up at some unearthly hour and slave away bent double in the strawberry fields. I'd much rather have been swaggering along inside a vintage loco, getting kidnapped by cowboys!! That is a GREAT story. They should bring that trip and locomotive back. I bet you thousands of people would be interested in taking a trip like that now! I would! Especially with all those re-anacted kidnapping scenes. What ever happened to it? By the way, the outfits, ADORABLE! Drowsey: Thank you! It was a wonderful first job; the people were so nice, and it was cool to work in such a historic venue. Kash: After a few years of hiatus, the train is working again... they do parties now and even a Santa run I see. I should send them my photos; I'll bet they would like them on their website (which I had linked). 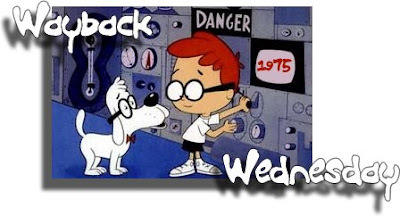 I love your Wayback Machine! Great story Maureen. You totally captured the thrill of the experience. Janet: Lenticular buttons and badges were all the rage; they had two images, and when you moved them from side to side, the images changed. The plastic cover on the button (the lenticular part) was ridged to make it look like images really moved. What a fantastic job and experience!!! I, too, am jealous. My first pocket money was as a chambermaid. What a fantastic post and a precious memory, Maureen. That picture of you (the closeup, I mean) is SO ADORABLE I hope you have it enlarged and framed and hanging in your house. Great story! You've written that up to submit for publication, haven't you? If not, you should! People who love old trains would adore reading it. That was a genuine adventure, did your knees tremble just a little bit and was the train robber handsome? Sounds like you had a wonderful job, especially the swaying with the train movement bit. I wonder if you can still move that smoothly on a train. Hey, you must have had great hand-eye coordination back then. Ah, the sweet memories of youth. The outlaw must have had a crush on you at the time. Irene: I WAS surprised! No one told me about the kidnapping part; apparently everyone else on staff knew, but me. I knew there was going to be a Train Robbery, but not the rest! I guess they wanted a realistic reaction to fool the tourists... If I remember correctly, it was the fellow in the photo with the dark horse who grabbed me. I adore your country; always have, ever since I was a little kid. This is one American who understands/gets Rick Mercer's political satire and thinks he's a scream!!! I keep having to explain to my hubby who some of the people are in Rick's rants. This is the first summer since 2003that I haven't gotten up to BC. What a fantastic story! And I love the outfit!! Wow! That was a great read! How exciting it must have been - being kidnapped by bandits. Wait a minute, did you say, "flattering overalls"? Seriously, that sounds like an awesome job, and that photo of you is as cute as can be. I bet they don't do the guns and horses thing these days. A passenger would probably whip out his own gun and start firing. I've only ever been a reporter. I have no stinkin' work history to talk of and definately not anything interesting. Why am I sharing? I have no idea...well, anyhow that was an awesome post. What a great memory and post. That was so cool. All of a sudden I wanted to be transported back to 1975 right along with you. JoJo: Oh, Rick, Rick... I think the funniest bit he did was with Bush, asking him when he was going to meet with our Prime Minister “Poutine” (poutine is french fries with cheese and gravy). It was hilarious! Babs: You’re welcome for the review Babs, well deserved! And yes, it was quite fun being swept away! JD: Yes, “flattering” because we sewed them to fit tight ;) (except for the flared legs). Jonny’s Mommy: Thank you. You’ve been a reporter? That would be exciting! WM: Ha! It brought back some great memories... which is one of the reasons why I love blogging about the past. My first time to your blog. I love it. What a wonderful story. You made a cute train girl! Love that hat! What a fun job! The train robbery definitely sounds like a great memory too. One of the scrapbooks, I'd say! wow great blog.. and great story indeed.. So, did you get any loot out of it? What a completly amazing job! You are so cooool! Very cool and well done! love the photos. I live in Summerland B.C. and they still run an old steam train on the Kettle Valley Railway. Biggie tourist attraction. They also do an ambush on horseback and take hostages from the train. When my daughter and grand son from England last visited we all went on the train. I am a brand new 1/2 day blogger! What a cool story, Maureen!!! Weren't you the cutie-pie (still are, don't you forget that!!!)!! Tammy: Welcome and thank you for your kind comment! Heather: I have done a scrapbook page as a matter of fact!!! Birdie: Lenticular buttons and badges had two images on them, and depending on the angle you looked at it from, the images would change. This was due to the ridged clear plastic covering. Our buttons had a picture of an eye open and the second picture of the eye closed, so when you moved it back and forth, it would “wink”. Momo: Ha! Nope, darn it! Jenna: Cool! That is great to hear things like this are still being done! this is such a great story. I have had a thousand different summer jobs.